It was such a lovely evening and I thought Point Chevalier beach would be perfect in the setting sun to show off a summery orange number. Why not start with a back view?! I’ve lived in central Auckland for twenty years, but only discovered this beach when I started running a few years ago – now it is a regular haunt. I often cannot resist stopping mid-run to have a few swings from a Pohutukawa tree like the kid here. If you ever feel in the doldrums go for a swing, I say! Sometimes the tide comes right up and you have to run in the water and up along this footpath. When the tide is out you can run right along the coast, although you might need your trail shoes! The sun is setting earlier, and the days are getting shorter here. It’s technically Autumn already and I’m still sewing summer! Starting to feel like it’s time to get some Autumn sewing goals in progress though. Obviously, this cut-away shoulder silhouette is one I am loving at the moment. It is very similar to that of my blue dress, but this time the pattern was traced from Burda Moden July 1969 so there are a few differences. The main pattern differences are a) the neckline – this one is closer fitting and hugs the neck, b) a more cut away shoulder – so much so that I had to whip out and invest in a new bra! and c) vertical front darts extending to the hem instead of my favoured french darts. The fit is actually really similar – amazing considering that I made my blue dress pattern from my modern dress block, and that the Burda pattern is from 1969! I cut a Burda size 38/40 (for some reason back then this was one size) (which is for a mind-numbing 34 3/4″ bust, 25 3/4″ waist, 37 1/8″ hip measurement) and it fits perfectly. The collar is another bias roll collar, except in this instance it is a true bias roll collar! I was probably incorrect in calling the collar on my blue dress a roll collar as it is really a bias stand collar. I presume this one is a true roll collar because it actually folds (rolls) over itself – don’t you agree? Please correct me if I am wrong here. On the subject of terminology – when I was designing bridal all the Italian mags referred to this neckline as ‘halter Americano’ – as opposed to the classic halter with neck strap and low front neckline. I haven’t heard this term anywhere else – has anybody else? It is useful to differentiate between the two halter neck styles as they are significantly different in design. Instead of facing the armholes like I did on my blue dress, I ‘inside bound’ them. This a technique I saw on a garment in a store many years ago, and I scratched my head for a few days trying to figure out how to get it perfect, and ever since then it is my go-to method for this type of fabric. Look – binding on the inside, no stitching on the outside – I love it! The fabric was from the same designer sale as my blue dress, and was a bargain at $5! It is a lightweight viscose, so light it is almost see through, but not, if you know what I mean. It was actually quite hard to sew – I have a slight dimple at the end of the zip, and the hem stitching is a little wrinkly in the bias areas. I should have spent more time perfecting them but you know – night-time sewing!! PS: I’ve joined the 2016 Vintage Pledge hosted by Marie at A Stitching Odyssey and Kerry at Kestrel Makes. My pledge is to sew five vintage patterns this year, but… each garment has to complete an outfit, no more orphan garments in my wardrobe! I’d also like to make the vintage patterns look modern rather than vintage. This top goes with denim, so that is a good start! Have you joined the 2016 Vintage Pledge? Are you starting to think about next season’s sewing projects yet? Lovely top, I really love a cutaway shoulder but it can be quite hard finding the right bra – strapless ones always feel a bit high maintenance! I kayaked around the Point Chev coast last weekend and had a renewed sense of love for the area after seeing how secluded the shoreline is. The beach is a bit sludgy at low tide but a total gem when it’s in! Strapless bras are high maintenance for me too! I managed to find an ok but not perfect one with adjustable straps that crossover. I love the local ambience of Pt Chev beach! Gorgeous top! I’d love to know how to do the “inside binding” that you used on the armholes. Lovely top, despite being a vintage pattern it looks very modern. Thanks Sigrid! I have the dilemma of loving vintage patterns, but also loving modern fashion, and I’m always trying to get the balance right. Pretty top and gorgeous backdrop! Now I’m scratching my head, trying to see what you did with the inside binding! Haha that was exactly me! I’ll see what I can do. Oh boy, I’m completely at a loss to figure out how you did that armhole binding. Is there an existing tutorial or would you be willing to write one? I would be ever so grateful. Your top is beautiful. Thank you jjdyson! I feel a tutorial coming on! Nice top! As an American, I have not heard of this type of top referred to as an american halter before. It was a bit of a mystery to me, but I happened upon some pictures of Claire McCardell designs, which have a similar cut-away top style with gathers (circa 1955 “American Look”). Perhaps that’s the source? Hi Jen, I think it is a European term as I’m sure I’ve seen Burda use it too, and maybe it arose because Claire McCardell made it a thing. Beautiful top! Perfect fit…cool style! Thanks Linda, I have been wearing it a lot, trying to get the most out of it before summer is over! In Germany, where I’m from, we say “Amerikanischer Ausschnitt” for this type of halter, translating to “american neckline”. So it might be a european thing. Thanks for sharing that Nele, it is so interesting how these terms come about! It seems like a tutorial might be popular! It always seemed wrong to me that halter neck was used to describe two quite different shapes, so when I first heard halter Americano it stuck! I just added the modern bit to my Vintage Pledge sidebar badge to try and keep me focused! very pretty and great sunset photos. I am such a fan of cut away shoulder tops and dresses. And to tell the truth I just use a piece of elastic with snaps sewn on to make a quasi-racer back bra. 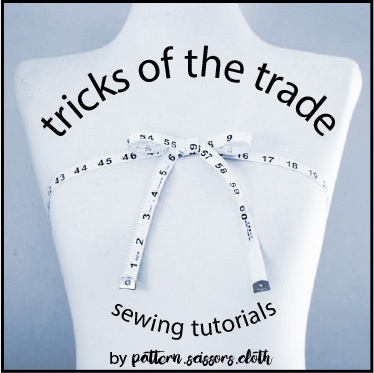 also the binding technique – please share how to do it!!! That’s a great idea Beth! When I went bra shopping the assistant mentioned a product like this but they were out of stock – I never thought to make my own! Your vintage top looks very modern, love the shape and the colour. Another who would like to know about the sleeve hole binding. I’m glad you think it looks modern too, binding tutorial coming up! Lovley top and lovely photos! Would love to hear how to do the binding. Bras are always an issue for cut a way tops. I have a couple of the free Marfy pattern tops which is very similar. This top is quite cut away, and the bra I purchased only just works! A beautiful, simple silhouette and lovely cool top! Your top is beautiful! I would love it if you would share your technique for your ” inside binding” used on the armholes. Keep up the good work! Thanks Ruth – I will! Just wanted to add my voice to those requesting more info on that binding technique! Ooo, inside binding technique? Please share!! Lovely top and beautiful photos! I really like the inner harbour beaches. Planning a swim at Herne Bay tonight. Saw a penguin there the other day! Is that clever binding created by attaching and then under stitching and pressing? It looks so pro!! Regarding the material being difficult to sew on – I’ve recently read that dipping it in a gelatin solution to stiffen it up helps. Afterwards, just wash it out. Looks pretty good to me, but then we all see where we wish it were different.